What if you could reduce anxiety, get unstuck, reduce pain, optimize mental and physical performance and promote a sense of well being – simply by learning how to move between four (4) modes of paying attention? A couple of years ago, I was laid off. In the throes of anxiety and panic, I stumbled on exactly the right book at the right moment. 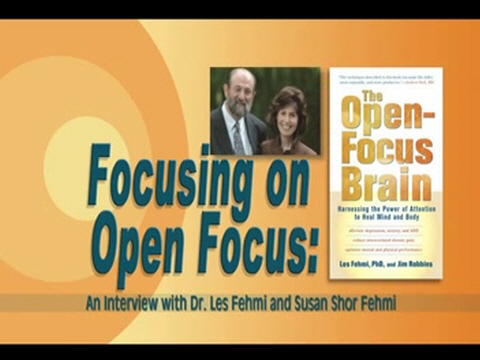 Written by Dr. Les Fehmi and science writer Jim Robbins, “The Open Focus Brain: Harnessing the Power of Attention to Heal Mind and Body”, the book includes a CD with simple attention-training exercises. And they worked – my knotted back muscles relaxed, my thoughts stopped spinning unproductively, and I could move forward. The world works in mysterious ways. Several weeks ago I found myself heading to Princeton, New Jersey to interview Dr. Fehmi and his wife and partner, Susan Shor Fehmi. I had the privilege of spending the afternoon in their company and hearing about their fascinating work – with adults and with children – on attention, open focus and neurofeedback. The short video clip below is from the Fehmi interview. By the way, there are still places available in the Fehmi’s Brain Synchrony/Open Focus Workshop in Princeton, from May 15-17th. It’s an opportunity to work directly with the Fehmi’s. Go to http://www.openfocus.com, or http://www.openfocus.com/WORKSHOP.html to find out more. Who can attend? Life coaches, therapists (for adults and children), body workers, health professionals, musicians, neurofeedback professionals, and individuals interested in personal growth or seeking to alleviate anxiety and pain. If you watch the complete intervew with Dr. and Susan Fehmi, you’ll hear them talk about their work with children who have ADD and other attention disorders, some of whom have been able to reduce their dependence on medication as a result. On a recent episode of 60 Minutes, Katie Couric interviewed college students about their use of Adderal to improve their focus; I wonder if they could accomplish the same thing using Open Focus instead of drugs? I’d be remiss if I didn’t mention my companions on the recent expedition to Princeton. they were Kurt Vega (the official interviewer), a certified Open Focus facilitator, a musician, and a social media expert for small business and corporate clients, and Terence Taylor (the official videographer), an award-winning children’s television writer, and author of two (so far) vampire novels. You can find out more about Kurt at http://www.linkedin.com/in/kurtvega, and about Terence at http://www.terencetaylor.com. All three of us have left our corporate careers behind, and are having a great time exploring new interests and a flexible workstyle. We ended up embarking on this project together because we took some risks, met some new people, and “just said yes” to an unexpected opportunity. I know I’m singing to the choir, but I’ll sing it anyway – reinventing what you do for work and income involves some soul searching and a lot of stepping out of the zone of comfort into the unknown. Anxiety is an all too common companion, just at a time when you want to be performing at your best. Learning Open Focus and “attentional flexibility” will help you self-correct and manage stress so you can thrive and be happy. I can’t wait to hear the full interview! I am intrigued by the prospect of reducing stress and anxiety when faced with a new project, so that I can just relax and focus on the tasks at hand. Louise, I have been a proponent of mind-body-spirit awareness, relaxation and reawakening through mindfulness, concentration, meditation, progressive relaxation and touch. I taught holistic health, stress management, yoga and all the components (relaxation, meditation, yogic diet, asanas, and spirituality) before these topics became more mainstream. I also studied and have worked with a wide variety of body therapy methods (shiatsu, polarity, craniosacral, Alexander Technique, Reiki, massage and many others) and have observed huge changes in bodies and minds of clients. But I have also trained in combining talk with touch, the Rubenfeld Synergy Method and somatoemotional release. So, in my case, you are certainly preaching to the choir. The new piece that the Fehmi’s have added, neurofeedback, explains scientifically what body therapists and those who worked with combining talk with touch have known for years. Thanks so much for taking the time to come and comment! I’m so glad you’re trying Open Focus brain exercises to deal with your chronic pain. Open Focus is also great for de-stressing and relaxing. You’re about to receive an email with a link to the free mp3 replay of the “Dissolving Pain” Book Launch and ALSO, registration is now open for the Two-Week Teleseminar with Les Fehmi and Susan Shor Fehmi. (October 6 & 13th). You”ll be coached by Les & Susan Fehmi on the calls.